Our recycled household purchase successes have been quite good lately; a bed, a side table, a side board, a day bed, many pictures, crockery, a blanket, a tablecloth, a Kenwood Chef food mixer, and the list goes on. All of the above could have been purchased new, but instead, we've been immersing ourselves in many avenues of recycled shopping to furnish our home; op shops, antique stores, markets, and online (Gumtree and eBay). The furniture pieces we've found, have quite obviously been made to last, hence why we still find them for sale second hand, decades after they've been made. 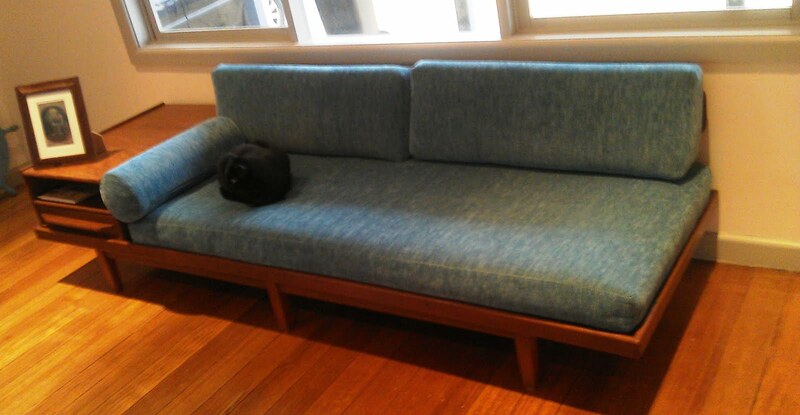 Our second hand 1960's day bed is a bit of a prized possession in our household, Her Royal Catness loves it too! We still have many household items on our list, we'll get them eventually, but as we prefer to buy second hand, we are certainly in no rush to complete our collection. Although my focus has been more interior than fashion lately, I've not completely foregone the fashion I happen to find. 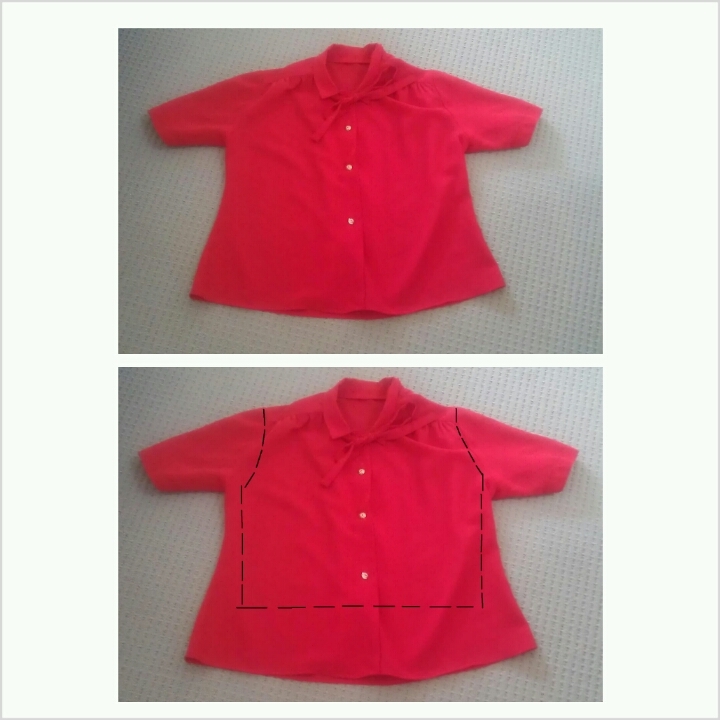 One of my local op shops recently relocated, after a browse through their new store location, I found a cute vintage red bow shirt, which needs a bit of tweaking, but has a lot of potential, and cost a whopping (!) $2.50. I'll need to get work on the sewing, my projects are lining up, and my restyling volunteer work with Hunter Gatherer will also be starting up very soon too. Readers, do you buy furniture and household goods second hand? Or perhaps you limit your recycled shopping to clothing only? YES! Our Salvo's couch is still going strong 10 years on (I recovered it last year) and most of our furniture is thrifted, not to mention the various books, fabrics, Manchester, crockery & cutlery, yarn, stationary, tchotchkes, etc we've picked up over the years! Most of my furniture is 2nd hand. Wood lasts for ages and classic designs change so little (or else OTT deco or atomic designs look so retro and fun) that it's easy to find stuff. One thing I am now cautious of is sofas and couches - I didn't get ours re-stuffed and now it kills my bad back. Looks 60s, but so uncomfy. I would always get 2nd hand couches re-stuffed now. We are trying to furnish our house with second hand pieces as well. We got a fantastic armchair second hand for £80 (when they still sell in the shop it is from for £600) and a 1970's dresser for £30 recently! Great furniture that doesn;t cost the Earth. I can see why Her Royal Catness would love that day bed - I could see myself lounging on that thing all day, every day! 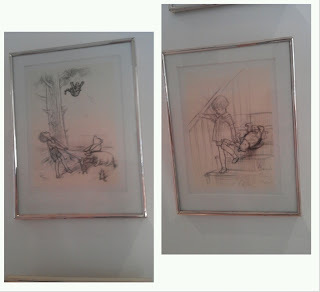 The Winnie The Pooh sketches are great too. I love finding art at op-shops. It looks like the new place is coming along fantastically! LOVE that couch. We have lots of secondhand stuff - crockery, furniture, fabrics, books, napery, haberdashery...in fact, I prefer to buy my house stuff and craft stuff second hand rather than my clothes - just because I find it easier to find cool stuff but not so easy to find clothes I really love. I simply LOVE vintage second hand furniture and fashion! Furnishing my apartment I chose second hand first prior to going mainstream retail. I agree the quality and workmanship is great. Super awesome couch! Great find.